Moshe Drelich presents a summary of his doctoral research, which explored the long term impact of a seventh-grade tefillah program. The full dissertation is available at http://bit.ly/2l7ASGV. Whenever I encounter a young child in synagogue on Shabbos, in addition to extending my hand with a greeting of “good Shabbos,” I deliberately bend down in order to meet the child where they are at; to make direct eye contact and greet them with a genuine smile. This conscious practice of connection sends a subtle but clear message of my desire to create a meaningful connection with the child. An important pedagogical construct for educators is to have the clearest and most accurate picture possible of who their students are, not only their level of academic ability, religious background but their social, emotional and psychological development. Adolescence is a time of great change in all these areas that often span more than a decade of maturation and growth. Common sense suggests that knowledge of adolescent development could be valuable in effectively guiding the educational process of adolescence. I offer here a brief overview of adolescent psychological development and along with data based on a two-year tefillah phenomenological research project involving interviews and feedback from 12th grade students from a modern Orthodox high school who had 5 years earlier participated in a 7th grade tefillah program (Tefillah-7) in modern Orthodox day school. The hope is to share this knowledge so it might serve as an aid for those who wish to develop a meaningful and enduring school prayer experiences for their students. Moshe Sokolow (2006) has commented that prayer is the most “frustrating subject” in modern Orthodox religious education. While knowledge of Hebrew and components of the prayer services are undoubtedly important and essential in developing prayer skills, they are not sufficient to make prayer meaningful and important to students nor do they seem to create the impetus for an enduring lifelong relationship with prayer. Research has demonstrated that an individual’s understanding of prayer and the content of his or her prayers shift dramatically across the developmental lifespan. In one study of youth ages 12-20 years of age, prayer was described as appearing in two developmental variants: young prayer and mature prayer (Perriello & Scarlett, 1991). The motivation of young prayer is a desire to have God change reality to match the wishes of the supplicant, with a focus on what God can do for the individual. Mature prayer, which emerges sometime during adolescence, shifts from a demand directed at God to a conversation with God. Mature prayer thus serves a reflexive function by enabling individuals, and in particular adolescents, to cope with challenges in their lives and to seek a “closeness” with God (Perriello & Scarlett, 1991). Other faith theoreticians concur, noting that adolescence is a time of searching for meaning a d purpose in life (Arnett, 2007). Rachael Kessler (2007), in discussing how to bring “soul” back into the classroom, argues for the importance of concentrating on “heart and meaning” as adolescents “grapple with the profound questions of loss, love and letting go… of meaning, purpose, and service… of self- reliance and community, and of choice and surrender.” According to Eric Erikson, the primary developmental task of adolescence is to navigate the two poles of “identity versus confusion,” a task requiring both reflection on the past and contemplation of future hopes, dreams and goals (Crain, 2011). In this process, adolescents engage in separation and individuation, becoming acutely aware of their individual selves as distinct entities apart from their families, communities and the world (Bryant-Davis et al., 2012). It is also a time when many begin to question what previously was adopted through blind acceptance, and when doubt, including religious doubt, is given voice. Yet James Fowler (1981) suggests that, as adolescents experience an increased desire for peer relationships, they also experience a parallel desire for a personal relationship with God. Gary Levine (2007) echoes this thought, suggesting that exploring a relationship with God and/or a Higher Power can be incorporated into the spiritual aspects of a religious school curriculum. Thus, it would appear that, during this period of “identity versus confusion” prayer might serve as a vehicle for exploring the self and a spiritual relationship with God. The role of spiritual exemplars is developed early on in a Jewish child’s religious education through the use of the Avot and Imhahot (Patriarchs and Matriarchs) as symbolic role models and ma`aseh avot siman labanim (the actions of the patriarchs are a paradigm for their descendants) is an explicit and implicit part of the curriculum in Jewish day schools. Interestingly, the portrayals of “exalted” role models in the Torah are notable for the realism of their struggles and strivings for perfection in the face of personal challenges and character flaws. In presenting the ideal as one who struggles spiritually, a tefillah educator embraces the adolescent who is searching for his faith, looking for personal meaning and struggling in the formation of his or her identity. Tefillah educators, as models, can only give what they themselves possess, spiritually and academically. Indeed, as Rav Kook was reported to have acknowledged, the word “hashpa’ah” (to influence others) comes from the word “shefa” (abundance); one must be overflowing to impact others (Grumet, 1991). Thus, teachers cannot give forth information that they do not know, nor can they inspire spiritual journeys in others unless they themselves have experienced or are experiencing a spiritual journey. James Jacobson-Maisels (2013) argues passionately for the importance of educators who have a “deep, conscious, meaningful and developed relationship with prayer” (p. 18) and who have “developed a systematic understanding of prayer as a spiritual practice” (p. 31). If a teacher experiences leading children in tefillah as a chore, it is unlikely that s/he will be able to convey the joy or warmth of tefillah to students. Alternatively, a teacher, in modeling joy and passion for tefillah may serve as a positive role model for the role of prayer in developing a healthy, honest and ongoing relationship with the Creator. Tefilla-7, at its inception, was designed to merge an authentic affective tefillah experience with didactic tefillah education. As tefillah is rich with foundational Jewish morals, values and beliefs, ideals of faith, trust and love of God, and Jewish identity, the instructional lens of tefillot is inherently imbued with concepts to penetrate the consciousness of students without disrupting the “spiritual flow” of the tefillah experience. In Tefilla-7, the role of the tefillah educator was to spark a passionate connection to the Creator within his or her students. Serving as a conductor of a spiritual orchestra with a musical score consisting of specific goals and objectives, the tefillah educator would help students to create a personal and meaningful experience of tefillah. This would be approached through affective and cognitive strategies, and would need to be implemented consistently in the face of student and/ or educator challenges, e.g., personal struggles, non-compliance or resistance, time constraints, language barriers, etc. Tefilla-7 incorporated didactic focal points (“mini shout-outs”) interspersed throughout the tefillah service. Each day, ideas or themes present in an upcoming paragraph or section of tefillah were offered to students as concepts to reflect upon in a personal way as they prayed. In this way, mini shout-outs also addressed one of the most difficult challenges of leading tefillah: maintaining a level of meaningful engagement throughout the entire service. For example, students were told that that every word of tefillah was an “eternal diamond,” a unique opportunity to connect to God. On Wednesdays, when the last of the daily prayers (Shir Shel Yom) was the longest of the week, students were asked to reconsider this prayer as an “opportunity” to collect the largest number of diamonds. Hence, Wednesday became concretized in the minds of many students’ minds as the ”Double Diamond Day,” and the prayer that had once seemed burdensome became meaningful. A second cornerstone of Tefilla-7 was openness on the part of the tefillah educator in sharing his own spiritual journey. Far beyond teaching the mechanics of prayer, the tefillah educator’s goal was to model a set of spiritual strategies and principles for managing life’s challenges. 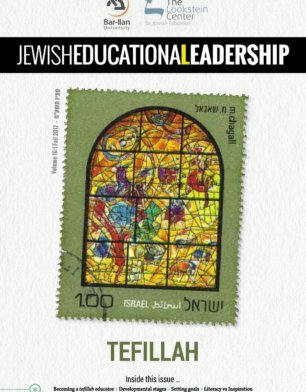 In opening a window to observe an authentic relationship with God, the tefillah educator’s goal was to establish trust and present the spiritual voice as one not of perfection, but of striving to be closer to the Creator, thereby giving students permission for their own spiritual struggles. Without trust, education could not occur, for if the student cannot connect to the source, s/he cannot accept that which emanates from the source. As John Gottman (2011) has noted, “trust and safety in relationships are the theoretical pillars of… attachment” (p. 30). Analysis of the phenomenological data revealed that 12th grade students were able to recall moments of high affective impact from their 7th grade tefillah experience more easily than specific content-based aspects of the Tefilla-7 program. Student inability to recall details about the Tefilla-7 program experience is not surprising given that Tefilla-7 occurred five years earlier. During the interviews, however, students did provide detailed and valuable information about the impact of specific components of 12th grade tefillah programs and, importantly, many of these key factors were also present in Tefilla-7. Analysis of the phenomenological data revealed that modeling involving students observing tefillah teachers engaged in prayer activities did not necessarily increase student engagement, and, at times had the opposite effect, especially when accompanied by authoritarian practices that emphasized compliance and/or coercion rather than spirituality or relationship. Of particular note was the plethora of negative comments students expressed about teachers whose primary focus was on keeping students quiet (“shushing”) or taking attendance (under threat of detention), the former causing cynicism and the latter creating resentment as many high school students taking buses or carpools did not have any control over their arrival times. In addition, any attempt to force students into a defined relationship with God was strongly rejected by the students, who repeatedly spoke about their need to create their own relationships with God. It is of interest to note that students were, in fact, motivated to develop a relationship with God, and contrasted their positive feelings about tefillah groups that allowed time for students to enter into their own kavvanah with negative feelings about tefillah groups that required students to launch into prayer immediately regardless of their state of spiritual readiness. In addition, students talked about feeling disconnected from the tefillah experience when they perceived tefillah educators as insincere, unprepared or not invested in the experience of tefilla. Students did respond in a positive manner to tefillah educators who appeared authentically connected to tefillah and prayed with an obvious sense of joy, the latter having what students described as a mirroring effect on their own experience of joy. Students also spoke of the positive impact of their tefillah educator providing cognitive spiritual insights, sharing how these insights transformed tefillah from a “burden” into an “opportunity” and from a “boring” experience into a “fun” experience. Of note is that the spiritual insights discussed were brief, constructed using visual imagery, and had immediate applicability. These findings were supported by analysis of the quantitative data demonstrating positive correlations between the cognitively-based mini shoutouts offered by the tefillah teacher in Tefillah-7 and students reporting that a) they experienced tefillah as a spiritual (rather than social) experience and b) they developed a positive attitude about tefillah as a result of participating in Tefillah-7. Another important finding was the positive impact on students when tefillah teachers used a relationship-based approach, taking a personal interest in the students’ lives or demonstrating respect for the students’ own strivings toward an authentic relationship with God. Students fondly reflected on teachers who took the time to celebrate meaningful events such as birthdays, supported them during challenging times such as the death of a parent, or regularly expressed interest in how they were doing in school or at home. In talking about these memories, students repeatedly used the word “caring.” They also commented on how a caring relationship generated respect, and encouraged an openness and receptivity to guidance, both didactic and through modeling. These findings clearly support the important role of the tefillah educator in the lives of Jewish students. The challenge is that this role, depending on how it is implemented, can have either enduring positive or negative effects. Nearly all students in the study consciously raised open-ended questions about the role they wished (e.g., How do I make tefillah mine? How do I grow from tefillah?). Interestingly, tefillah appeared to serve as a vehicle not only for the exploration of spiritual identity, but also for an exploration of other aspects of identity, e.g., leadership, public speaking. Several students spoke about their tefillah in the context of questioning the previously unquestioned aspects of their religious identity (e.g., the meaning of being Kohen and “social orthodoxy” as a positive or negative construct), evaluating which aspects were in alignment with their emerging identities and which were to be rejected. While Most students appeared engaged in active identity exploration and individuation. 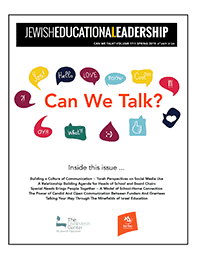 This study demonstrated that connecting students to tefillah is best achieved through the experience of an authentic, transparent and caring relationship between teacher and student. The tefillah educator must prioritize building trusting and caring relationships with students to open the gates of interest, a thirst for knowledge, and learning. To clarify, “caring” does not refer to a non-directive or permissive teaching style; rather, it refers to an authoritative and empathic stance that welcomes discussion, holds confusion, and encourages growth. It is about being present and constant in the students’ lives. When teachers earn their students’ trust, they will engage their hearts in the pursuit of wisdom, as it is written, “an understanding heart will pursue wisdom” (Proverbs 15:14). It is also essential to foster a culture of choice, a sense of community and communal responsibility. This involves providing opportunities for students to try on different religious “hats” through the offering of alternative minyanim, openly valuing peerto- peer support, and encouraging active participation by creating leadership opportunities for both men and women. It is about seeking out opportunities to celebrate the uniqueness of each student during tefillah services and paying attention to who is sad or struggling on any given day. Transmitting the importance of tefillah is not just about “shushing” to obtain quiet in the room or perfunctorily taking attendance and giving detentions when students arrive late. Ultimately, if we are serious as educators about helping our students cultivate an enduring relationship with their Creator, we are charged to undertake a far-reaching and delicate exercise. We cannot come from the perspective of one who has already accepted all the tenets of our faith, for adolescence is a time when students are questioning all the tenets of their faith. In recognizing the weight of their own responsibility in creating relationships – including spiritual relationships – forming a relationship with an eternal and all-powerful God is a serious and thoughtful enterprise, perhaps, sometimes even overwhelming and daunting. Unanswerable questions arise, and finding an open ear and open heart of one who is spiritually invested – an educator – can provide a steady light in the turbulent storm of adolescent confusion and identity formation. In this regard, it is also important that we take seriously the need to separate Hebrew fluency and comprehension from spiritual fluency and comprehension, supporting each separately so that they will eventually merge into a unified whole. It’s about bending down and making eye contact and meeting the students where they are. References Arnett, J. (2007). Emerging adulthood: What is it and what is it good for? Society for Research in Child Development, 1(2), 68-73. Bryant-Davis, T., Ellis, M., Burke-Maynard, E., Moon, N., Counts, P., & Anderson, G. (2012). Religiosity, spirituality and trauma recovery in the lives of children and adolescents. Professional Psychology: Research and Practice, 43(4), 306-314. Crain, W. (2011). Vygotsky’s social-historical theory of cognitive development. In W. Crain, Theories of development, concepts & applications (pp. 224-252). Upper Saddle River, NJ: Prentice Hall. Golombek, E. (2004, Winter). Action research report on the approach for creating meaningful tefillah experiences in middle school. Retrieved July 1, 2015, from The Lookstein Center for Jewish Education: Gottman, J. (2011). The science of trust. New York, NY: W.W. Norton & Company. Grumet, Z. (1991). Creating a tefillah environment: Personal and institutional priorities. Ten Da’at, 5(2), 39-40. Fowler, J. (1981). Stages of faith: The psychology of human development and the quest for meaning. New York, Harper & Row. Hirsch, S. (1992). Collected writings of Rabbi Samson Raphael Hirsch (Vol. VII). (J. Breuer, Ed.) New York, Feldheim Publishers. Perriello, L., & Scarlett, W. (1991, Summer). The development of prayer in adolescence. New Directions for Child Development, 52, 63-76. Sokolow, M. (2006). Educating for prayer: Utilizing the writings of Rabbi Joseph B. Soloveitchik: Curricular & Instructional Guides. New York. Moshe Drelich (mdrelich@sarhighschool.org) is an innovative master teacher and administrator who has been in the field of Jewish education for over 30 years. Rabbi Dr. Drelich currently teaches Jewish studies at SAR High School in Riverdale NY.